U.S. President Barack Obama delivers remarks on the Clean Power Plan at the White House in Washington Aug. 3, 2015. U.S. President Barack Obama is planning a major speech Wednesday to argue for congressional and public support for the international accord to restrain Iran's nuclear program. The president also is meeting with American Jewish leaders later Tuesday to promote the accord, which bars Iran from building an atomic weapon in exchange for lifting Western and U.N. sanctions that have crippled Iran's economy. Israel and many Jewish leaders in the United States have criticized the nuclear accord. White House spokesman Josh Earnest, who confirmed the president's plans, said Mr. Obama will discuss the key issues that explain why the accord deserves widespread support, and why Congress should back the international effort to prevent Iran from getting a nuclear weapon through diplomacy. No one else has put forth a legitimate option to curtailing Iran's nuclear program other than military action, Earnest said on Monday. On Capitol Hill, the chairman of the Senate Foreign Relations Committee emerged from a meeting with top intelligence officials Monday with doubts that the U.S. could effectively detect any effort by Iran to circumvent the terms of the landmark agreement reached last month in Vienna. Asked whether the United States or the other major powers that negotiated the deal with Iran could detect any "cheating," Senator Bob Corker said: “No, I am not confident of that. I don’t think anybody could tell you that they are particularly confident about that." Congress is roughly midway through a 60-day review of the pact and is expected to vote next month on whether to accept or reject it. Corker, a Republican, said that will be "a really tough decision," and he delined to predict the outcome of the vote. The spokesman said no one else has put forth a legitimate option to curtailing Iran's nuclear program other than the military option. FILE- Senator Bob Corker speaks to reporters at the U.S. Capitol in Washington. Many lawmakers say they need to be convinced that Iran’s compliance can be verified, and any violations detected. Corker said the task is far greater than simply keeping tabs on Iran’s known nuclear facilities. A public-opinion survey released Monday by Quinnipiac University in Connecticut said most American citizens oppose the Iranian nuclear accord and think it will make the world less safe. The poll showed registered U.S. voters, by a 57 percent to 28 percent margin, oppose the deal the United States and five other world powers finalized last month with Tehran. By a similar 58 - 30 percent margin, the voters said the deal would make the world less safe. A total of 1,644 people were surveyed, with the rest of the people questioned saying they had no opinion, did not know whether they favor the deal or whether it will make the world safer. Corker and other senators on his committee were briefed Monday by the Director of National Intelligence’s top deputy for Iran. Committee members were able to read top-secret documents and ask questions about the U.S. intelligence community’s ability to monitor Iran’s nuclear program and detect atomic activities, including any violations of Tehran’s commitments to the international community. The public and reporters were barred from the meeting. 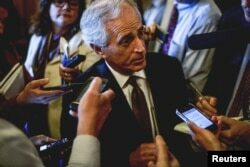 Corker said the task is far greater than simply keeping tabs on Iran’s known nuclear facilities. Democratic Senator Tim Kaine disagreed: “[The Iranians] have cheated and we have known about it before we had inspections. We are going to get very rigorous inspections, Iran-specific inspections. 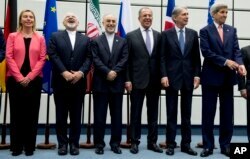 From left to right: Members of P5+1 group involved in negotiating nuclear deal with Iran in Vienna, Austria. A public opinion poll released Monday shows by a 2-1 margin U.S. citizens oppose the Iranian nuclear accord and think it will make the world less safe. The poll by Quinnipiac University in Connecticut showed registered U.S. voters, by a 57 percent to 28 percent margin, oppose the deal the United States and five other world powers finalized last month with Tehran.